Professor Lai’s reputation is best known in the field of Library Science. He co-founded the Department of Library and Information Sciences at the National Taiwan University. He developed the widely used “New Classification Scheme for Chinese Libraries” （中 國 圖 書 分 類 法 ）. It could be said that he is one of the founding fathers in the field of Library Science in Taiwan. Reputation aside, his real personal interest is historical research. He belongs to the first group of scholars who devoted themselves to the study of the history of Taiwan. He is the pioneer researcher for the 17th century history of Taiwan. He has written The Studies of History of Taiwan, premier volume (台灣史研究初集). , and has compiled Annals of Taiwan Province, volume 3: Foreign Affairs (台灣省通志稿卷三外事志). He is one of the founding members of the journal, “Taiwan Folk Ways (臺灣風物)”, which has been published since 1951. It is the longest running scholarly journal in the study of Taiwan. Professor Lai, was one of the most important contributing authors for the journal’s first 20 years. Ever a meticulous and thorough scholar with wide range of interests in history, Professor Lai has begun to focus on the Christianity in Taiwan since turning 65. He has been devoted to his faith since he was baptized with his mother at youth. He served as an elder both at Hoping Church in Taipei and the Boston Taiwanese Christian Church. In 1965, he edited Literature on history of Christianity in Taiwan (基督教台灣宣教史文獻). It then was included in the book, Century of the Presbyterian Church in Taiwan (台灣基督長老教會百年史) as an appendix. He has continued to research and gather literatures since moving to the United States in 1972. He issued One Leaf Communication (壹葉通訊) to share the important historical facts with friends and relatives and gather relevant information from them. Later at the invitation of Pastor Jun-yi Lu (盧俊義), Editor-in-Chief of Taiwan Church News (台灣教會公報), he started writing the column, “Church Folklore” (教會史話) for the Taiwan Church News in 1988. The column consists of about 1000 characters. It appeared on 674 issues and was subsequently published as a 5 volume book set. Later Elder Lai suspended the column claiming health issues. Soon after, Elder Lai, the ever avid learner, started to use the computer. He adapted to the new technology easily and thrived with it. In January 2007, he launched his website, Elder Lai’s Archives”, with the assistance of Hsiu-Ching Lee (李秀卿), wife of Pastor Shi-yang Lin (林皙陽). With the permission of “Taiwan Church News” Network, he updated, digitized and made his “Church Folklore” columns entirely available on his website. In addition, he has been adding his own published work and his personal archives categorized by topics into his website. Many are willing to provide Elder Lai their personal information because they trust him. They have confidence in his character and his capability. He has established an irrefutable credibility. 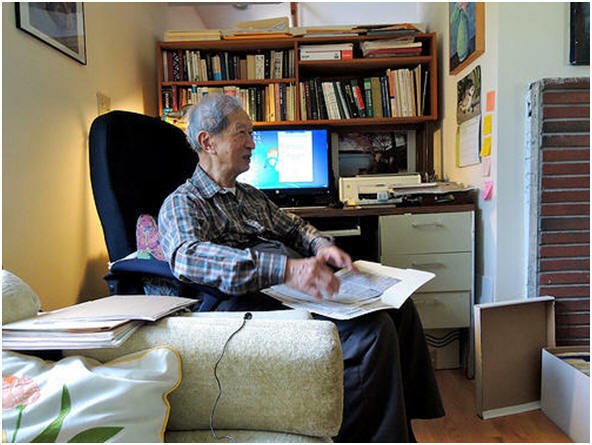 The value of Elder Lai’s website is not just the vast materials he collected over the years. It is how they are organized. They are classified, cataloged and linked with great care and scholarly insights. It is how he connects bits and pieces of information and turns them into something meaningful and useful. His scholarly capabilities are beyond compare. Furthermore, instead of keeping his archives as proprietary information, he published them on his website so people could use them. His website is like a well designed library. Regardless of whether you are an occasional browser, a general reader, a searching student or an expert scholar in the field, you are able to find useful information from his well organized website. You may even find a springboard for your further quest. Elder Lai said that he is doing this out of his personal interest. Nevertheless, he works tenaciously and shares openly without seeking accolades. The generosity he has shown is not common among the scholars in such a specialized field. I think it could not be possible if it were not for his dedicated faith and his sense of mission to the church. Praising Elder Lai’s work aside, I can not help but feeling bad that the Presbyterian Church in Taiwan has not yet established a “Resource Center of Taiwan Christian History”. The planning for a historical archival center has been going on for years, but it has never entered an actual working stage. Christianity in Taiwan will celebrate its 150th anniversary in 2015. By then, I hope the stage will be set. Elder Lai has set a high standard, I hope future generations will carry on his work.